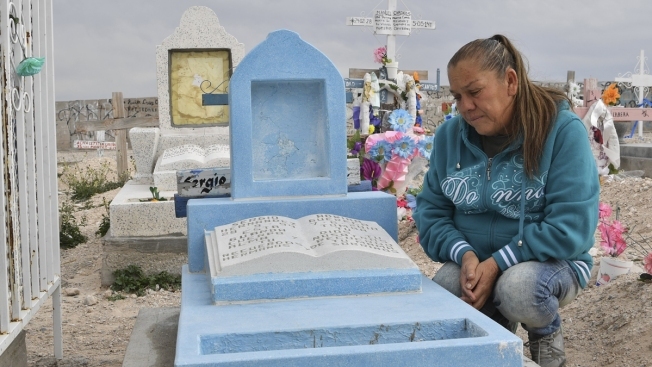 Sixty feet and the U.S-Mexico border separated the unarmed, 15-year-old Mexican boy and the U.S. Border Patrol agent who killed him with a gunshot to the head early on a June evening in 2010. U.S. officials chose not to prosecute Agent Jesus Mesa Jr. and the Obama administration refused a request to extradite him so that he could face criminal charges in Mexico. When the parents of Sergio Adrian Hernandez Guereca tried to sue Mesa in an American court for violating their son's rights, federal judges dismissed their claims. The Supreme Court on Tuesday is hearing the parents' appeal, which their lawyers say is their last hope for some measure of justice. The legal issues are different, but the Supreme Court case resembles the court battle over President Donald Trump's ban on travelers from seven majority Muslim nations in at least one sense. Courts examining both issues are weighing whether foreigners can have their day in U.S. courts. Privacy experts also are watching the case because it could affect how courts treat global internet surveillance, particularly when foreigners are involved. It's there that the "Fourth Amendment question in Hernandez seems to matter most," George Washington University law professor Orin Kerr wrote on the Volokh Conspiracy blog. The Fourth Amendment protects against unreasonable searches and seizures. Precisely what happened in the cement culvert that separates El Paso, Texas, and Ciudad Juarez, Mexico, is in dispute, although the competing accounts are legally irrelevant to the court's decision. Sergio's family says he was messing around with his friends that day, playing a game in which they ran down the culvert from the Mexican side and up the American side to touch an 18-foot fence. Mesa arrived on a bicycle and detained one person while the others scampered back across the culvert, actually the dry bed of the Rio Grande River. He then shot Sergio as the boy ran toward a pillar supporting an overhead rail bridge. Mesa and other agents who arrived on the scene rode away on their bikes, without checking on the boy or offering medical aid, the family says. The Justice Department said Mesa was trying to stop "smugglers attempting an illegal border crossing" and fired his gun after he came under a barrage of rocks. Mesa argues in his court filings that Sergio was among the rock throwers. But Robert Hilliard, the family's lawyer, said U.S. officials met privately with the parents to explain the decision not to prosecute Mesa and told them that their son had not thrown rocks. A cellphone video appears to show that Sergio was running and trying to hide before he was shot. Had Sergio been shot a few feet to the north, he would have been on American soil and U.S. courts would be open to his family, Hilliard said. There's no dispute that Mesa was on the U.S. side of the border, he said. If the family is kept out of court, Hilliard said, the Supreme Court will be saying "that 100 percent of the conduct of a domestic police officer in the United States is unconstrained by the U.S. Constitution." The family is seeking at least $10 million, Hilliard has said. The Trump administration, like its predecessor, is arguing that the location of Hernandez's death, in Mexico, should be the end of the story. The right to sue "should not be extended to aliens injured abroad," the government said in its court filing. In addition, the government said the parents' claims under the Fourth Amendment should be dismissed because its protections against unreasonable search and seizure don't apply to non-citizens outside the U.S. The government also said Mesa should be shielded from liability for the shooting, even if the family could prove he violated other rights Sergio might be able to assert. Judge Edward Prado of the 5th U.S. Circuit Court of Appeals initially voted to allow the case to proceed because "if ever a case could be said to present an official abuse of power so arbitrary as to shock the conscience," Sergio's shooting appeared to be it. The full 5th Circuit later sided with Mesa. Sergio's shooting was not an isolated border episode. Parents of a teenager killed in Nogales, Mexico, from gunshots fired across the border by a U.S. agent have filed a civil rights lawsuit that is being delayed until the Supreme Court rules. The government's response to that shooting was notable because prosecutors are pursuing second-degree murder charges against Agent Lonnie Swartz. In that episode, 16-year-old Jose Antonio Elena Rodriguez was hit about 10 times by shots fired across the border from Arizona. The Border Patrol has said Swartz was defending himself against rock-throwers. The boy's family says he was not involved and was walking home after playing basketball with friends. Swartz is on leave and his trial is set for June. A 2013 report commissioned by U.S. Customs and Border Protection and written by an outside group faulted the agency for insufficiently investigating the 67 shootings that took place from 2010 to 2012 and questioned the use of force in some of those cases. The agency has said it has tightened its policies, particularly in response to rock-throwers.